A vital part of growing in any profession is maintaining a certain level of continuing education. Whether to refine business or advanced skills, it can sometimes be hard to find the time to attend a large conference or fit in a specific course. However, once we do make the time commitment, we also need to budget for the financial one. You know that large conference you go to every year or that big-ticket course you've been eyeing? We all have one that we tend to prefer, but how do we afford to commit to them every year, or at least frequently enough to keep up our knowledge and skills on a given topic? How do we budget for these without affecting our bottom line too much at the end of the day? 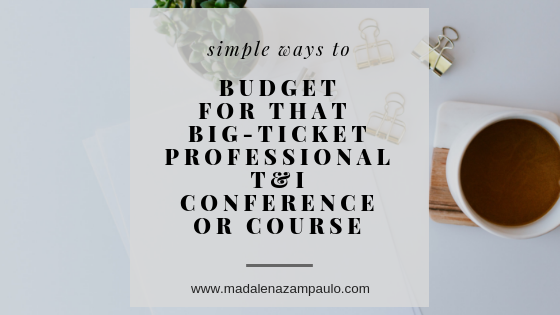 Here are my top tips for budgeting for those high-ticket professional translation/interpreting conferences or business courses. If you know that you plan to go to an annual conference every year, and you have an idea of what it will cost you, you have to plan ahead. Let's say that the annual conference you like to attend costs about $5,000 out of pocket. That means you have 12 months to put aside that $5,000. You could take a proactive approach and earmark around $500 of your monthly income to set aside for the $5,000 conference. This means that you'll have paid it off in advance and you will not have any conference debt once you return home. To read more about how to plan for T&I income and expenses, check out How to Plan and Track Sales Revenue in Your T&I Business and Start Earning More and How to Project and Track Expenses in Your T&I Business to Increase Your Profit Margins. ● Know that you will also need to budget for any income "lost" from the days you'll be attending the conference or taking off work to put time toward a course or workshop. If you make an average of $500 a day, then you will need to plan to earn this money ahead of time to cover the days you'll be taking off. A full week off to attend a conference = $2,500. Add that to the hypothetical conference expenses mentioned above, and you may need to up your monthly earmarked savings to $625 to play it safe. This way, you can pay yourself while you're away from your desk. After all, you are still working, even if you're learning. So, you might as well be getting paid for it. If you need to adjust your rates to factor in this cost in your business, this might be something to consider as well. Of course, give your clients plenty of notice if you plan to raise rates at any point in the year and make sure that you're providing better value when you do. ● Check to see if there's a payment plan of any sort. A lot of online courses these days allow you to pay in installments. This can be a great option to afford something that otherwise would seem beyond your means, because it doesn't hit your bank account all at once. Read the fine print first, though. I recently found one payment plan that seemed like a good deal until I realized that I would have to pay $250 more for a 9-week course than if I paid the full amount out of pocket. In the end, I opted to pay the full amount, knowing that I did not want to shell out an extra $250. What I learn from the course should help me to earn the money back if I use the knowledge I gain correctly. ● Consider working weekends and holidays so that you can pay for the conference or course "on the side". If pulling the course or conference money out of your regular income bothers you, consider ways of earning the money outside your normal income. If you don't normally work on the weekends or on holidays for clients, this could be a great place to start. Once that "extra" money comes in, put it into a separate account and watch it grow. By the time the course comes up or conference week starts, you should hopefully have a sizeable amount to put toward it. On a similar note, consider taking on more rush jobs. But do this carefully, as you don't want to let your desire to pay for continuing education opportunities to cause you to produce less than your best quality work. ● Remember that you can probably make this expense tax deductible. In many countries, continuing education can be tax deductible. But talk to your tax preparer before you commit so that you know exactly what you can deduct. Don't let the big-ticket aspect of continuing education scare you from attending the annual conference you've been eyeing or taking that course that you know will benefit you in your business in the long term. Just play it smart and budget for it. Need a tool to help with that? Check out my Expense Planner for the T&I Professional.